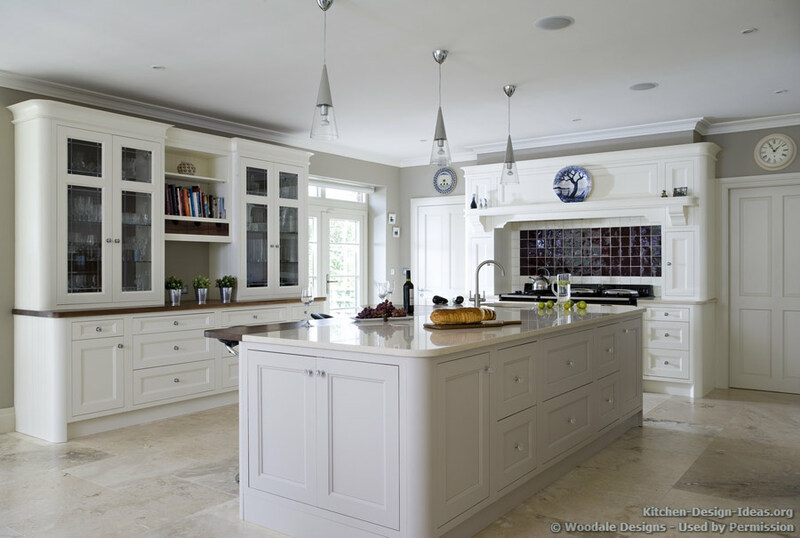 Woodale Designs a family-run kitchen design and manufacturing company based in Ireland. They have designed and built many beautiful projects since 1987. 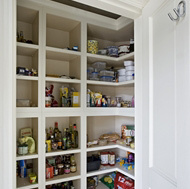 Below is a sampling of their residential kitchen portfolio. Enjoy! 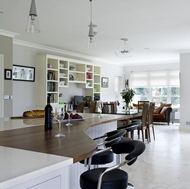 Natural light floods into the kitchen through skylights and two walls of windows in the entryway. 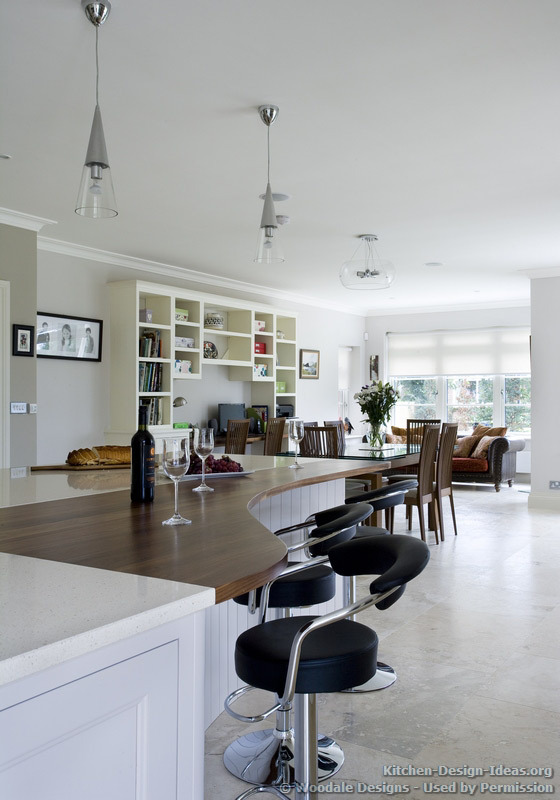 Organic curves along the back of the island provide a comfortable place to sit with four counter-height padded bar stools. 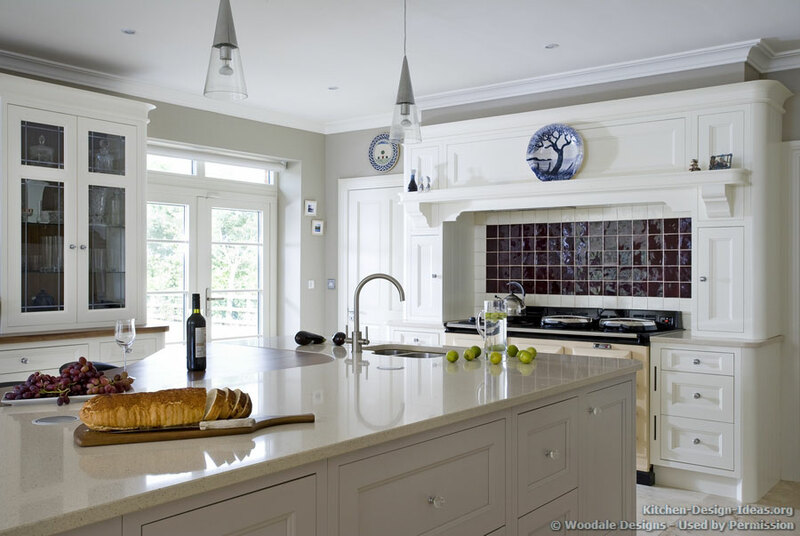 A simple yet elegant wood hood (by Woodale Designs) adds dimension to the room. 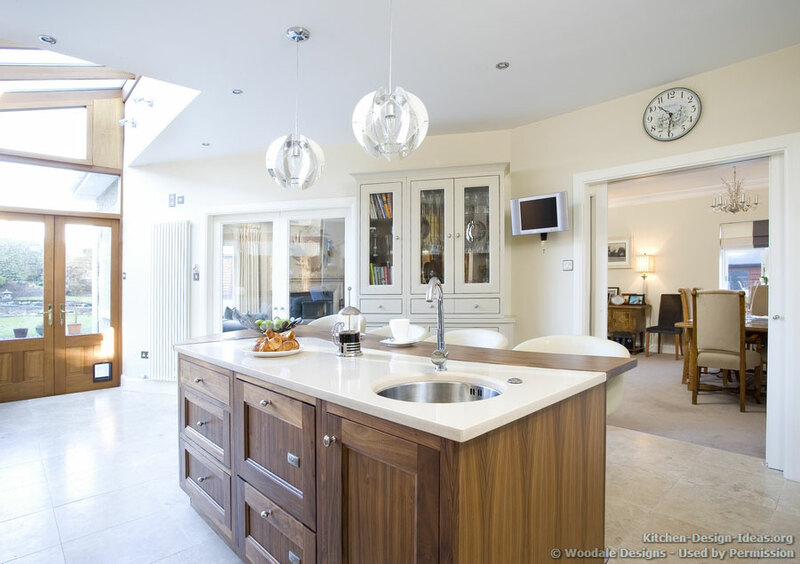 This beautiful two-tone kitchen features a walnut wood island set against creamy white painted cabinets along the perimeter of the room. 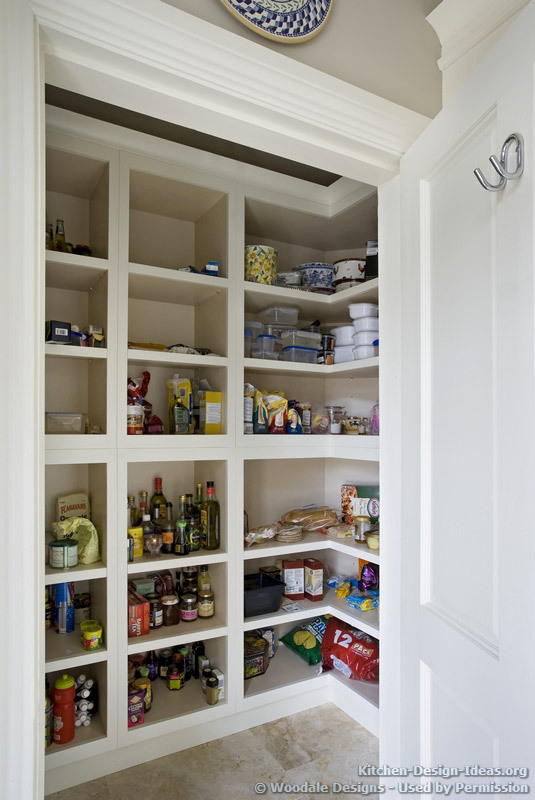 High ceilings allow for glass upper cabinets along the back wall, where the refrigerator, ovens, pantry, and a metal tambour cabinet reside. 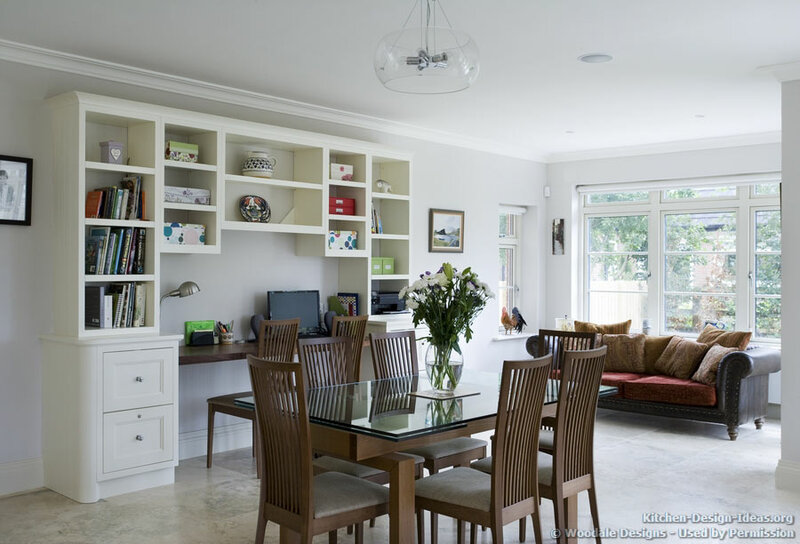 Unique modern pendant lights add drama and illuminate the island. 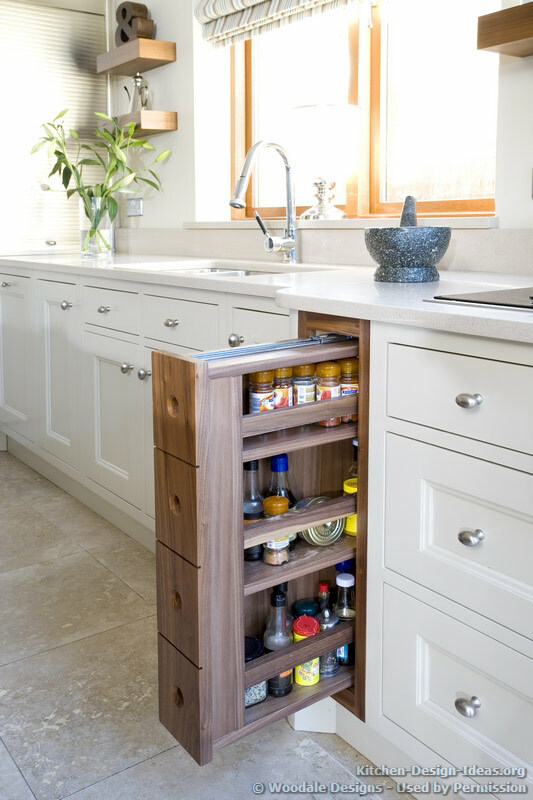 The island has two countertop materials on one plane; engineered quartz on the prep side and a solid walnut countertop on the bar side and over the curved end cabinet. 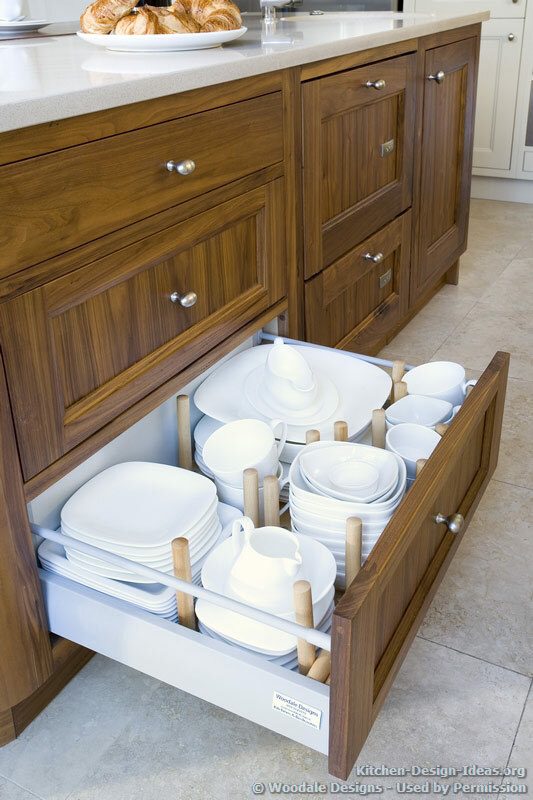 The beautiful walnut island is crafted with inset cabinetry and includes both a stainless steel prep sink and Fisher & Paykel dishwasher drawers panelized in wood with only the small controls showing in front. Sliding glass entry doors separate the kitchen from the dining and living areas, allowing the homeowner to keep sound levels down or enjoy an open-plan feel. 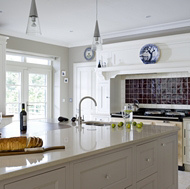 Exquisite inset cabinetry with curved radius ends gives this lovely white kitchen a retro, classic ambiance. Three cone-shaped pendant lights add light and charm over the large island, while a large mantel-style wood hood adorns the back wall. 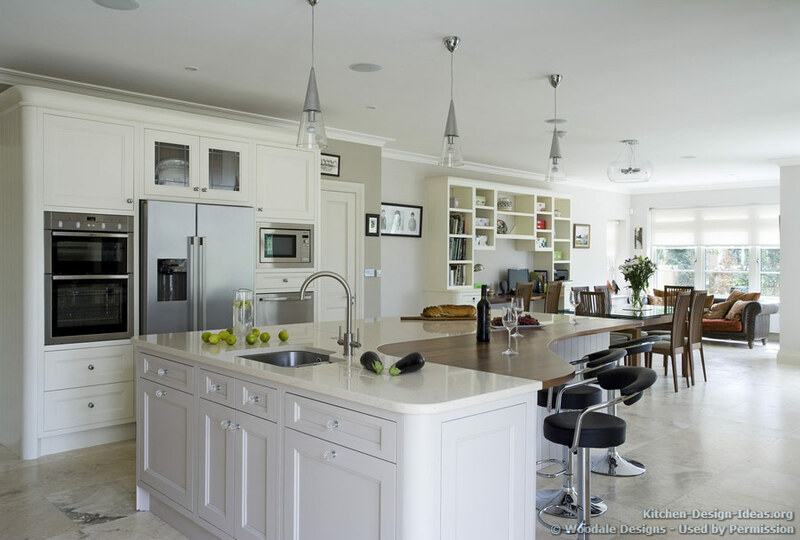 Custom glass china cabinets with walnut countertops sit across from the island's eating area. 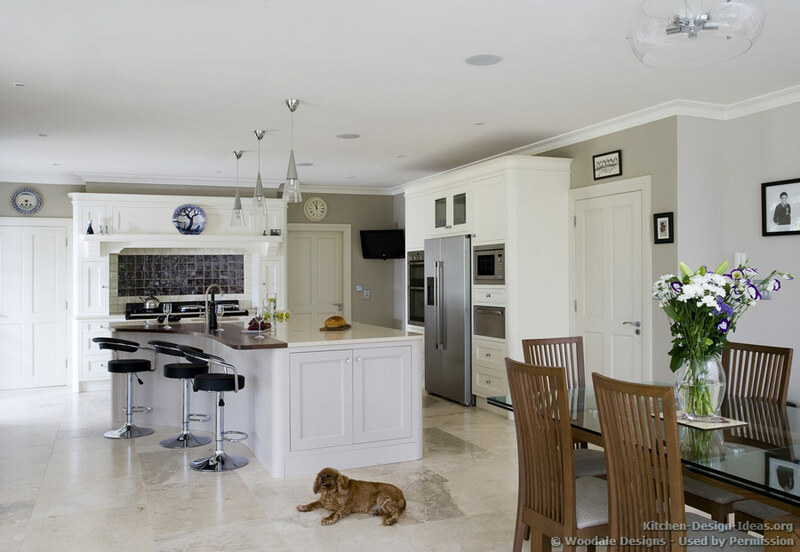 This open-plan kitchen flows into a modest dining area and study. 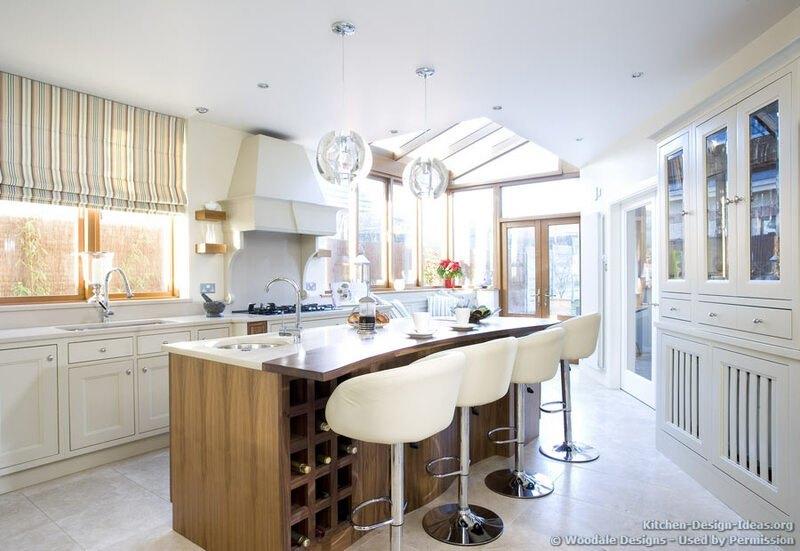 The piano-shaped island includes the main sink and a combination of beige quartz and walnut wood countertops. Chrome and bar stools with leather seat backs are situated along the inner curve of the island, further adding to the retro feel. 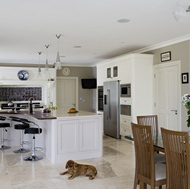 Travertine tile floors keep the room light and bright. 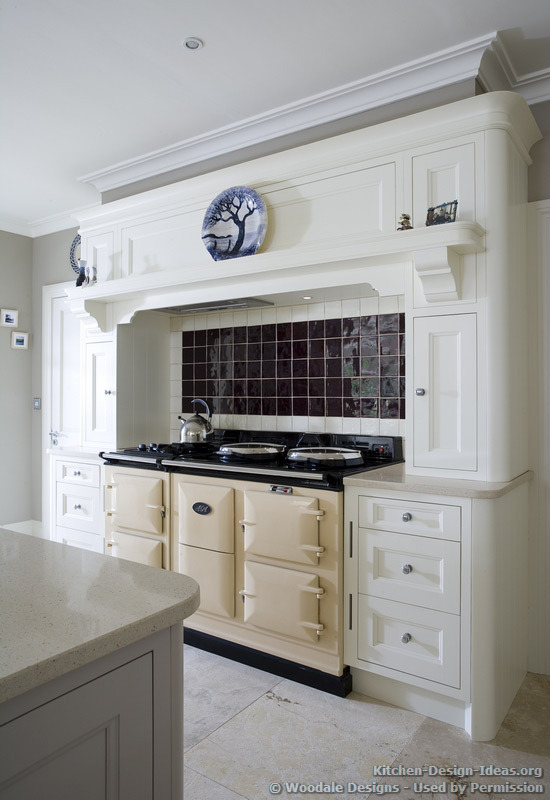 Sitting beneath the large mantel range hood is a cream-colored AGA range with a black cooktop and classic styling. 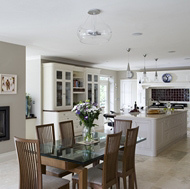 The hood's radius moldings play well against the curves on the range cooker, while the soft gray walls contrast nicely with the painted cabinets and travertine floors. A simple square tile ceramic backsplash provides a dark glossy contrast to the softer colors in the room. 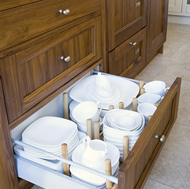 Company Profile: Woodale Designs manufactures and designs custom made kitchens as well as furniture for the entire home. 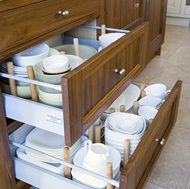 They are a family-run business with over 25 years of experience building custom kitchens and cabinets. 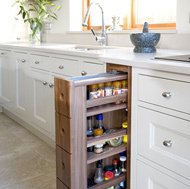 They have assured us that each kitchen is handmade using only solid wood materials sourced in America, Canada and Europe. 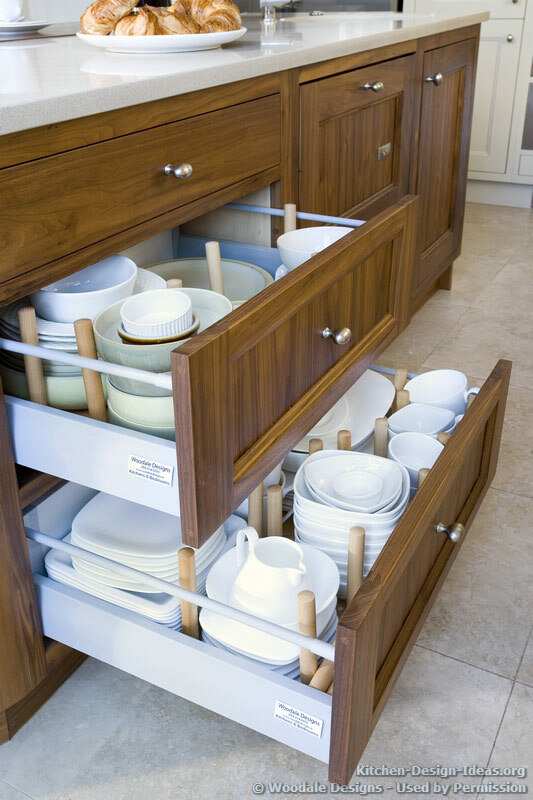 Their bespoke (custom) furniture is supplied throughout Ireland and the UK with specialist pieces being exported as far as America. 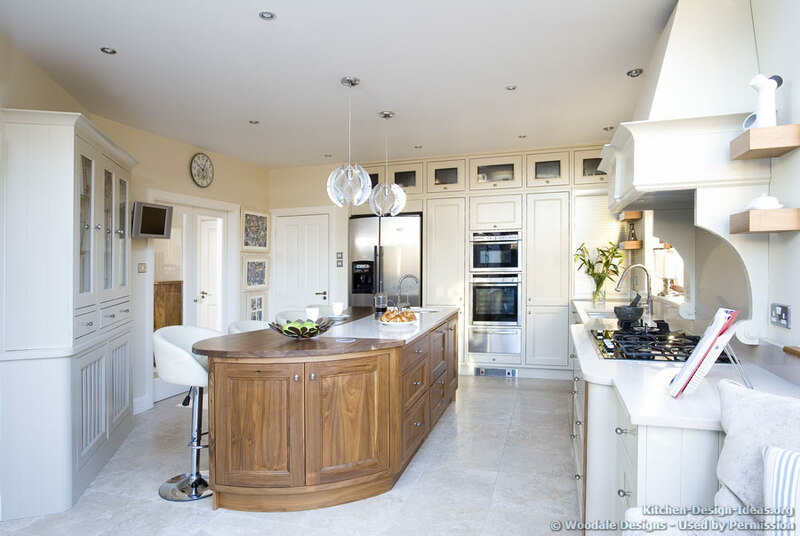 The company clearly takes pride in their work and their stated aim is "to have each kitchen become the focal point in the home." 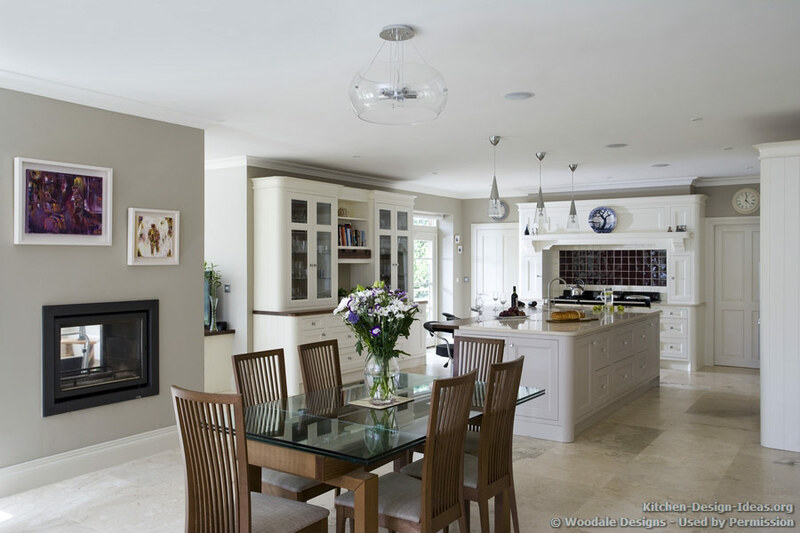 Based on the pictures that we've seen here, if you are a homeowner in Ireland looking for great quality kitchens, be sure to give Woodale Designs a good long look.